Package contains almost all shapes you can imagine and can meet almost all of your needs; This set of 36 cookie cutters with gift box packaging, is also a perfect gift choice. The sizes of the cookie cutters vary, as well as shapes, so please check our detailed pictures for various sizes and shapes. We provide more sizes for some more commonly used shapes, so you can do a lot of creative baking. Your kids will enjoy their snacks! Cut star shapes from fruits, cheese, vegetables, breads etc and see your kids eat them all!! 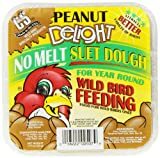 Take it to another level and inspire learning; Kids will learn their shapes in a fun way using play dough to cut out shapes! Whether as daily household use, as party supplies, or as gift options, this set is definitely a wise choice! 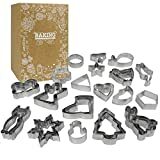 Our set of 36 cookie cutters contain all shapes you can imagine: star, heart, triangle, pentagon, flower, moon, dolphin, butterfly, small tree, snowflake, kitten, rabbit, little man, bird, and sock shapes. We provide more sizes for some more commonly used shapes, so you can do a lot of creative baking with your imagination. Your kids will enjoy their snacks! Cut star shapes from fruits, cheese, vegetables, breads etc and see your kids eat them all!! Take it to another level and inspire learning; Kids will learn their shapes in a fun way using Play-Doh to cut out shapes! 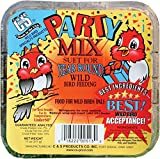 Party Mix Suet is made with a variety of seeds, nuts and fruit which puts it in the category to have the BEST wild bird acceptance year round.